The interbank market is where supply and demand meets – for the financial sector including banks, investment funds, central banks, international financial institutions, brokers, and in the best situation also orders from broker's clients. Understanding the principles of how financial markets and the execution of transactions on the interbank market work is essential knowledge for successful trading on the financial markets. Imagine the interbank market as a financial system in which the world's largest banks and other financial institutions are electronically, by telephone, or otherwise connected together. Some of the transactions are carried out by banks themselves, and other transactions may be executed by the bank or broker for their clients. Transactions on the interbank market are executed here both for profit and to also to hedge, i.e. ensuring risks arising from the activities of corporations. 50% This is the volume of interbank transactions compared to all transactions in the financial system. Small retail traders and speculators are not able to directly send their transactions in the interbank market, since access to the interbank market involves very high capital and technology requirements. However, for these traders it is extremely important that their provider (broker), will send all transactions for an execution to the real interbank market. It is the only place where traders can execute their trading orders without conflicts of interest, and this will enable them to achieve long-term profitable results. The most important players on the interbank market are banks, i.e. market makers. 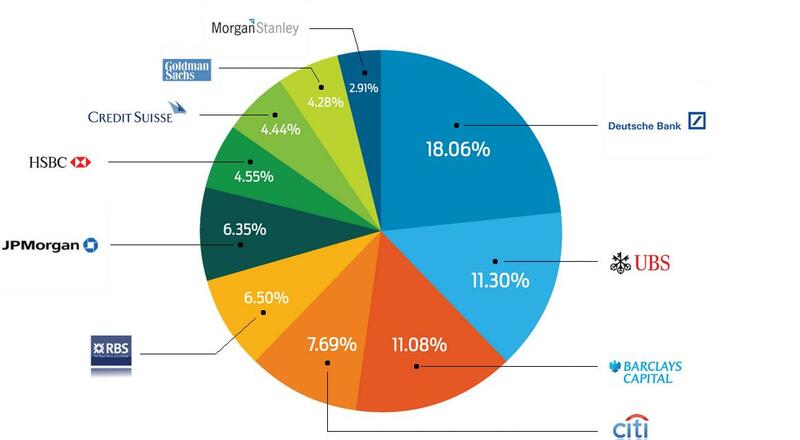 The most active and the biggest banks in the interbank market are: Deutsche Bank, UBS, Barclays, Citibank, Bank of America, JP Morgan, Morgan Stanley, Commerzbank, BNP Paribas, Credit Suisse, RBS, and others who operate in the market as liquidity providers, i.e. they act as a counterparty to the interbank market. On the interbank market, traders can participate through true STP / ECN Direct Market Access brokers, but 98% of brokers in the world offering STP / ECN trading accounts do not send clients’ trades on the real interbank market, but instead to only one market maker which directly participates in the loss of their clients. Therefore, it is extremely important to choose the right broker. So if you do not trade through a market maker who sets their own quotes that correspond to interbank rates, but usually they do not, then the STP / ECN DMA broker creates the lowest possible spread based on the current BIDs and ASKs of liquidity providers (banks). These banks will then act as counterparties of your transactions. 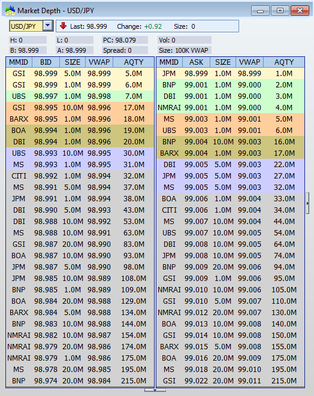 Interbank spreads of STP / ECN DMA brokers usually reflects the quality of liquidity providers of the broker. The broker then adds his own commission representing his profit to the raw interbank market spread. These spreads are shown in trading platforms, and based on these spreads clients will do their transactions. The second possibility is that the broker directly provides the interbank market raw spreads to his clients, and transparently charges commissions when opening and closing the trades. In the picture below you can see how experienced and trustworthy (good) STP / ECN DMA brokers create a spread. A very important aspect of any broker, which is not spoken about very much, is called Market Depth. Depth of market presents different price levels and indicates what trade volumes can be executed at a given price level. Usually lower volumes are available close to the current rate and the further from the current rate volumes increase. In the picture below, you can also see which counterparty will be chosen for our trade (for example - "JPM" stands for J.P. Morgan; "BNP" stands for BNP Paribas and "GSI" is Goldman Sachs International). In case you trade with a market maker broker or with an ECN / STP broker who has only one liquidity provider you will always have a single counterparty – the market maker with whom you will have a high conflict of interest, and they will not allow you to make money in the financial market. The key to profitable trading is therefore to have a broker who chooses among a large amount of liquidity providers and always chooses the most suitable one. Here you can see how prices are moving in the market. If some high volume orders come to the market, they are executed according to the depth of the market at a higher or lower price level depending on the type of order (short / long) and basically it takes liquidity at the current price level. This is what causes the movement of prices in the market. You can also see above why some of our trades are executed at a different price than that at which we enter the transaction to the market. The difference between these two prices is called slippage, and the amount of slippage is immediately included in the costs of our trade. And here we come to the core of the problem in the execution of trading orders. Slippage is the most important factor of trading that very often completely overshadows the spread and the commission, or any other fees. For example, if you enter a long trade at the trading platform with a volume of 1 lot at the price of 1.35050, and the broker will fill your order at the price of 1.35055, you are immediately at a loss except spread further 5 USD. If instead your order is filled at 1.35045, then at your trade you will get a positive slippage, which increases the gain or reduces the loss by 5 USD. The slippage is a common thing, which you will get with all types of brokers, especially when you are trying to execute high volumes in tens or hundreds of lots (because of the depth of the market), or if you trade in a period of strong fundamentals - simply because of latency, since the market moves extremely fast. Slippage strongly depends on the quality of liquidity providers your broker uses, and also on the technology the broker uses. However, the problem is how the vast majority of forex brokers work - if they can fill your order for a better price, they execute it for the better price, but they do not count the positive slippage in your trade, and thus the amount of slippage goes immediately into your broker's pocket. Obviously these types of brokers will always add a negative slippage to your trades. Poor quality brokers may even artificially increase the slippage. Slippage in extreme cases with bad brokers can reach tens of pips, and the average of slippage will be much higher than the spread. After a hundred trades executed, the slippage at a poor quality brokers with a volume of 1 lot could lead to costs of thousands of dollars! Slippage is the main reason why exactly the same trading strategy (for example Expert Advisor) with different brokers will always achieve absolutely different results - and there can be huge differences. Even the best strategy in the world can become a loss with a poor quality broker. Conversely, average quality trading strategies at brokers with excellent technology will achieve consistently profitable results. As the team FX Trading Revolution, we definitely recommend trading only with a fair broker who applies both positive and negative slippages to your trades. ADVISORY WARNING: Any news, opinions, research, data, or other information is provided as general market commentary and does not constitute investment or trading advice. FXTradingRevolution.com expressly disclaims any liability for any lost principal or profits without limitation which may arise directly or indirectly from the use of or reliance on such information.